The eight equal-sized curved thermoplastic segments of a pressure bulkhead were bonded together at DLR-ZLP in Augsburg using resistance welding. 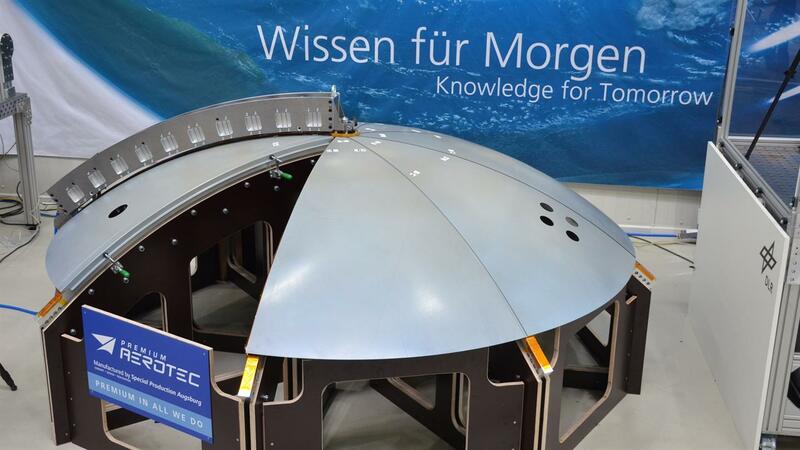 The world’s first pressure bulkhead demonstrator made of carbon fibre reinforced thermoplastic was made at ZLP Augsburg using a resistance welding process. In order to be able to determine the optimum welding method for every application, ZLP Augsburg is researching the automation of various different bonding processes. In this image, the end effector for automated resistance welding of fibre-reinforced thermoplastic clips. Tape-laying machine at DLR’s Institute of Structures and Design in Stuttgart, with a rotating axis and rotary/tilt table. A perfectly manufactured pressure bulkhead is essential for safe flight. This component forms an airtight barrier between the passenger cabin – and the rest of the pressurised fuselage – and the tail section. Only with this bulkhead can the correct air pressure be maintained in the aircraft. The German Aerospace Center (Deutsches Zentrum für Luft- und Raumfahrt; DLR) has demonstrated an innovative technology that enables the welding of pressure bulkheads made of carbon fibre reinforced plastic (CFRP). 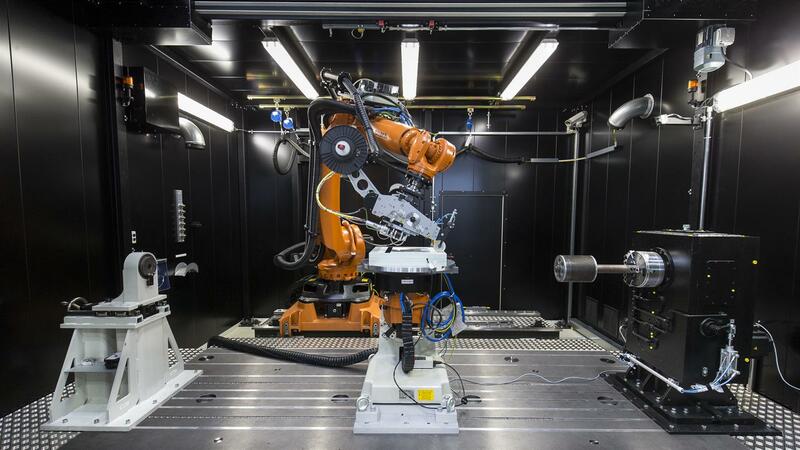 Using this method, DLR's Center for Lightweight-Production-Technology (Zentrum für Leichtbauproduktionstechnologie; ZLP) in Augsburg was able to produce a 1:1 scale demonstrator component very quickly. The production-quality pressure bulkhead for aircraft of the A320 family was designed by leading aeronautics industry supplier Premium AEROTEC and manufactured in collaboration with a number of research establishments. The CFRP component is now on display at the ILA Berlin Air Show. "In producing the pressure bulkhead here at DLR-ZLP Augsburg, we have shown that this welding process can also be used on large, curved components with long seams," explains Michael Kupke, Head of ZLP Augsburg. "Our work is helping to ensure that the potential of thermoplastics technology to reduce process times, lower process costs and increase production rates will in future be able to be exploited even for large aircraft components." Up to now, the use of thermoplastic materials has been limited to smaller components, such as clips that are used in the CFRP fuselage of the A350 XWB. Thermoplastics possess special properties; while they retain a stable shape when cold, they can be reshaped if reheated to a certain temperature range. DLR's researchers at ZLP Augsburg have made use of the formability and weldability of this material when bonding the individual components. A total of eight pressure bulkhead segments of equal size were joined together by electrical resistance welding. This welding method enables a whole-surface, substance-to-substance bond to be made. 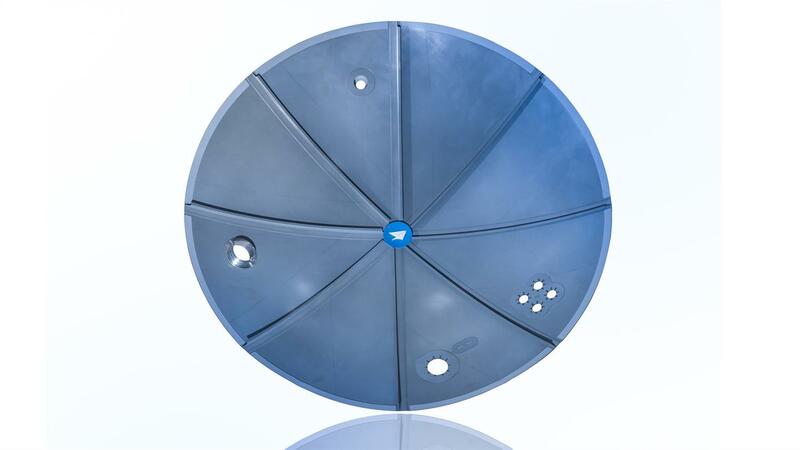 In addition, unlike metal bulkheads, no rivets are needed, which saves weight while at the same time reducing production time and manufacturing costs. As no holes are drilled, the load-bearing fibres remain intact and no dust is produced. Other advantages include a high degree of process reliability and comprehensive options for integrated quality assurance. Because there is a great deal of potential for automation with this welding method and tolerance management is easy, it is very well suited to efficient series production. In order to be able to determine the best welding method for every application, ZLP Augsburg is researching the automation of other bonding processes, such as continuous ultrasonic welding. ZLP Augsburg is part of the DLR Institute of Structures and Design, which already has decades of experience in the processing of thermoplastics. The Institute's researchers at DLR's Stuttgart site are studying how reinforcing layers can be positioned and bonded exactly where they are needed, based on the forces acting on the component. They have a robot-assisted tape-laying machine for the placement of thermoplastic tapes. Using this machine, the pressure bulkhead can, in a single pass, be strengthened exactly where it will be subject to particular loads, such as around openings through which pipes will be routed. By means of thermoplastic tape laying, which is also suitable for large structures, it is possible to build up the material layer by layer and consolidate it all in the same process. The aim of the research is to be able to dispense with expensive vacuum equipment and autoclave processes. The development of high-performance thermoplastic structures at the DLR Institute of Structures and Design addresses topics ranging from design and manufacturing technology through to flexible automation solutions for production. Researchers in Stuttgart and Augsburg have already established an integrated production process for the manufacture of thermoplastic components. With their research, they are helping to ensure that the correct material, a suitable construction technique and an appropriate production technology are available for every application. 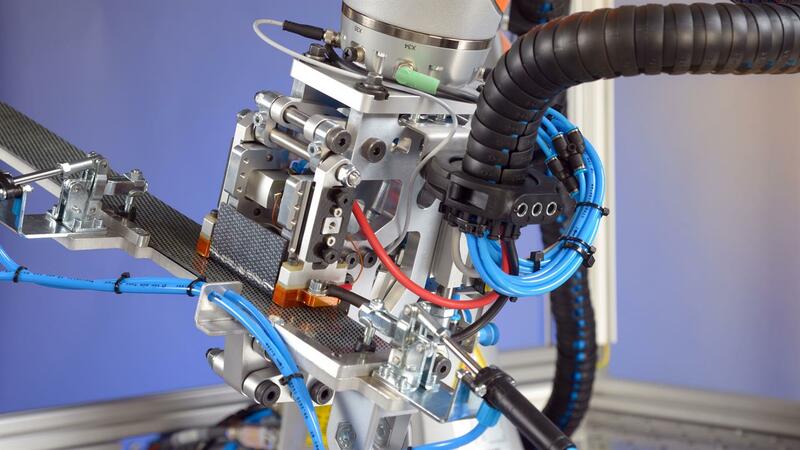 DLR's Center for Lightweight-Production-Technology (Zentrum für Leichtbauproduktionstechnologie; ZLP) in Augsburg is researching the automation and integrated optimisation of production processes for lightweight structures. The main focus is robot-assisted manufacturing of components and assemblies for the aerospace industry. In addition to component scaling, the emphasis is on flexible automation and integrated quality assurance. An adaptable infrastructure that is unique in Europe allows this research to be carried right through to industrialisation capability. Working together with industry, a wide variety of production processes can be developed, automated and validated according to demand. ZLP Augsburg, together with ZLP Stade, is part of the DLR alliance 'Center for Lightweight Production Technology ZLP'.